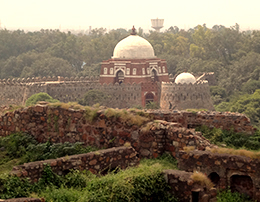 Once a symbolic might of the Tughlaq dynasty, the third city of Delhi Tughlaqabad was built by Ghiyasuddin Tughlaaq, the founder of Tughlaq Dynasty. Another architectural marvel which was never completed and inhabited, is the first living example of massive bastions, heavy stones and a fort built in defensive architecture. The Fort that was Cursed!